The RYA Powerboat Scheme is applicable to Sportsboats, RIBS, Dories, Launches, and other boats which do not normally provide accommodation or cooking facilities. Jon Mendez is the author of “Start Powerboating”, the official handbook issued with all RYA Powerboat Level 2 courses and the RYA DVD’s “Boat Handling for Sportsboats and Ribs” and “Ribs and Sportsboats at Sea”. Mendez Marine offers excellent professional and comprehensive training on quality equipment. We mainly use full time instructors and most teach right up to Yachtmaster level with a wealth of experience behind them. Our powerboat instructors are chosen not only for their skill, but for their sense of humour and passion for boating. Remember you can charter our boats after so you can keep your skill level up. 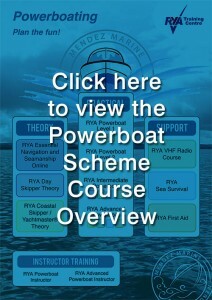 RYA Powerboat courses can be run on your own boat (from £299 per day) with a maximum of 3 students per boat. simply enter in your details and we will generate suitable courses.